Women activists in the UK discuss anarchism, feminism and the relationship between the personal and the political in extracts from interviews carried out by myself and Lynn Alderson in 1977. The extracts were made at the time and are previously unpublished, though I used some material from them in my 2010 article The Gender Politics of Anarchist History. The whereabouts of the original tapes, or longer transcripts, is unknown, though we still have hopes of recovering them. For now, these partial transcripts are all there is. Note on Text: In line with the original intention that the interviewees would remain anonymous, I have given them pseudonyms, and made one or two minor alterations. Editorial amendments are indicated in square brackets [1977 edits] or square brackets and italics [2014 edits]. Ellipses appear in the original transcriptions, indicating cuts. In a couple of instances I have made additional small cuts, indicated with […], to remove repetition or obscurity. 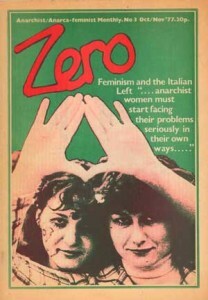 Download Anarchism and Feminism: Voices from the Seventies as a Word document. This work is licensed under a Creative Commons Attribution-NonCommercial 4.0 International License. Rose: My politics have always come from what I experience, rather than theory. Louise: If you’re working towards a free society you have to think about everything. Carol: I thought that anarchism had more to offer.